Each BREEZE Litter System (sold separately) uses specially designed, cat-friendly litter pellets that are dehydrating, anti-tracking and 99.9% dust free. These pellets allow liquids to pass through to the absorbent cat pad below, while helping dehydrate solid waste that remains on top for quick, easy scooping and outstanding odor control. One 3.5-lb pouch lasts up to one month. Litter Pellets Simple Setup & Maintenance: 1. 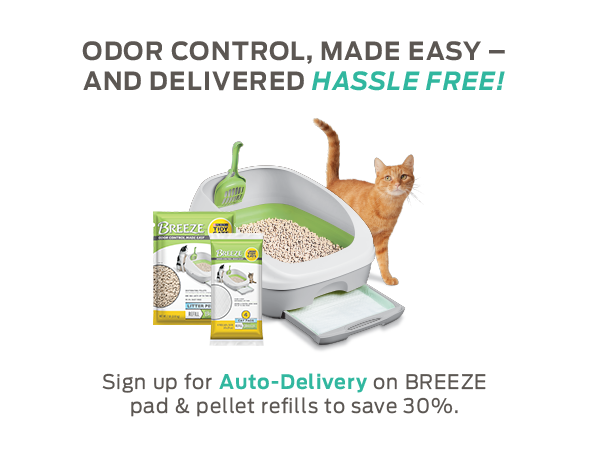 Fill the top portion of the BREEZE Litter System with one 3.5 lb. package of litter pellets. 2. Scoop out solid waste and dispose of daily (pellets do not clump) 3. Add more pellets as needed. We recommend that you replace the pellets completely once a month. Contains Mordenite Zeolite, a natural mineral.